Surrounded by the high mountains of the Pennine Alps, Zermatt lies at the southern end of the Matter Valley in Switzerland. Monte Rosa is the highest peak (4, 634 metres) and it is followed by the Dom, Lyskamm, Weisshorn and Matterhorn. Although all of them have their own distinguishable features, it is maybe Matterhorn (Toblerone Mountain) that has become the symbol of Zermatt. Its conical shape attracts people from all over the world, making Zermatt to be visited in every part of the year: in winter for its outstanding ski runs and in summer for its hiking opportunities. Geographically small, Zermatt has around three main streets around the river Matter Vispa. However, this small village is densely populated, especially during the winter season. The nearest airport is Zurich airport and you will need to plan your transfer from Zurich airport to Zermatt. You can choose public transportation or airport taxis for your ski transfer from the airport to Zermatt. In order to prevent air pollution, Zermatt is a car-free zone and can be reached by cog railway train from Tasch, which is the last point where vehicles can go. From there you can take the train that runs every 15-20 minutes. A more convenient option is to book a private ski transfer from Zurich airport to Zermatt or any other location and you will be directly driven by taxi to Tasch, and from there you will be taken to Zermatt by special electric vehicles. The airport transfer is organized in advance and you don’t have to worry how to fit in your luggage and equipment in the taxi. The price for airport transfer to Zermatt is fixed and per vehicle. If you’re a larger group, you can share the cost for the taxi transfer and book a larger vehicle like minivan or bus. To reach Zermatt, you will travel through tunnels and narrow roads, emerging a sense of darkness in you mixed up with some obscure enthusiasm. The outcome is spectacular: the world’s highest peaks graciously spreading before you. The mountains vary in the level of difficulty in climbing. The Breithorn is the easiest peak to climb. You can use lifts to reach the peak and after 2h climbing, you get to the top. Matterhorn or the Toblerone Mountain is only for experienced climbers due to its unique form and posture. Although you can see Matterhorn from every part of the village, only from the top of it you can see the whole village. The view is worth the effort. However, the peak cannot be reached in a couple of hours. It usually takes up to 2 days, with one night spent in a stone building at the middle of the mountain and early start the following day. Maybe the most difficult to reach is Monte Rosa and you need to be experienced climber to undertake this adventure. A must thing to do when going towards Matterhorn is to take a stop near the lake and admire the blending colours and the whole mountain mirroring in a very clear and accurate way. The best part of the day is early morning before sunrise or at sunset. 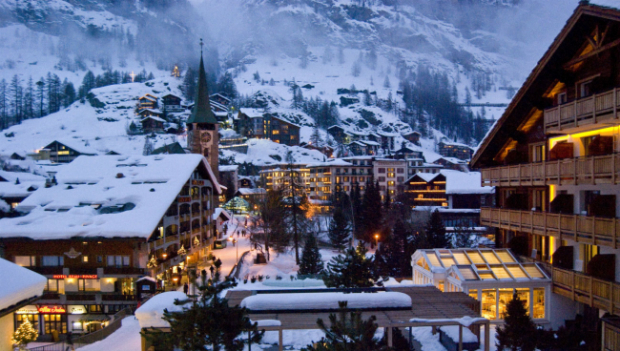 Zermatt is a dreamland for winter sports enthusiasts. The three main ski slope areas: the Klein Matterhorn, the Sunnegga and the Gornergrata offer 250 km of pistes for all levels of skiers. The advanced skiers especially will appreciate the black pistes, which can be found everywhere in Zermatt. For snowboarders, there are good terrain and a halfpipe in Riffelberg as well as in Klein Matterhorn, where they can enjoy this sport in the snowboarding park. Sledging can be underestimated and in Zermatt is more than a cliche as it takes you to a different level. On the Gornergrat, there is a fast run which covers 234 metres and provides a 10 minutes ride with fabulous mountain view. Staying at Zermatt will cost quite a lot. The exquisite scenery, popularity, location, celebrities’ visits, make this place look luxurious with incredible 126 hotels and over 2700 apartments to rent. Splendour restaurants and bars are also there to serve you at any time of the day. Nevertheless, if you are knowledgeable of camping and on a budget, you can always camp in the lap of the mountains surrounded by the opulent landscape. There is also an open camping area for beginners. One can never be bored in Zermatt. No matter if you come in a group, as a couple, as a family, you can always find something interesting to do and visit. There are plenty of bars, cafes, restaurants, museums, and entertaining stuff for children. Seemingly small, Zermatt has turned in a metropolitan village that can offer you numerous recreations. All of the major sights in Zermatt are located on the main street – Bahnhofstrasse, thus you will not need to walk a lot. You can find everything you need at less than 5 minutes distance. There are a lot of small and narrow streets also, connecting all parts of the village. Zermatt officially has a population of around 5-6000 residents, but this number increases highly during the season. There is something for everybody. You can have a pleasant dinner at some restaurant, go to a museum, have children play with St. Bernard dogs, go shopping, or take a stroll.